Mansfield Plumbing has introduced a new generation of bathing experiences for tension-riddled people. 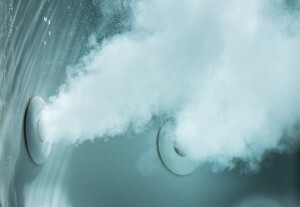 The new MicroDermTM Therapeutic Bath silently infuses bathwater with millions of microbubbles to help a bather relax, unwind and feel rejuvenated. Available now from Mansfield Plumbing in the company’s Swirl-way® product line in 25 models with tub unit sizes of 60″ x 32″ to 72″ x 42″, the MicroDerm comes in rectangular, oval and corner shapes. There are 25 different tubs, including both one- and two-person versions. Tub colors include white, bone, biscuit, almond, black, ice gray and British khaki. Trim finishes are available in white, bone, biscuit and polished chrome.